The Schweiz National Park was right on the border with the Czech Republic so it was only a matter of half an hour and we were in Czech. It is another EU country and at the border we just cruised through without stopping. The old buildings are still there and one must slow down to wind through them, but no customs or other checks (Czechs). This area is a very fertile farming countryside of small villages and farms. 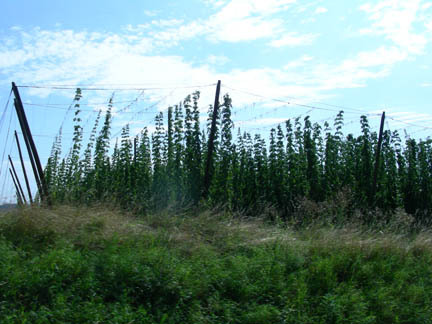 Some of which were growing my favorite flower, hops! (Kathy prefers something more colorful). 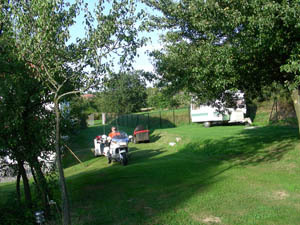 Prague was our first stop and we found a camping ground described by the guidebook. There are a row of older houses on long narrow tracts of land, about 50 m. (yds.) by 150 m. (yds.). Six of them have taken the long narrow backyard and made a camping area and built a toilet/shower block in the front yard. The one we picked was nice with free wireless internet where I updated the last batch of pages. Our first stop was the Mucha Museum, he is the famous art-nouveau artist that really popularized that art in posters of Sarah Bernhardt in Paris, France. No pictures were allowed inside the museum (and the outside was very plain). He is my favorite artist and did much more than posters (continue reading on this page). 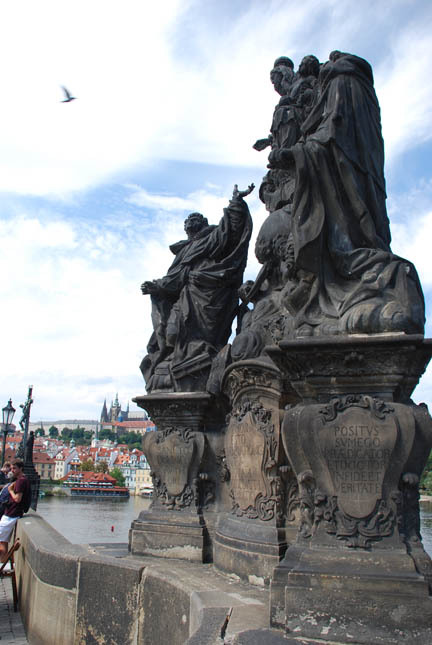 We then walked to the famous "Charles Bridge" with eighteen statues along the sides. Only pedestrians allowed, but they were out in droves. Prague Castle (the largest in Europe) is in the background. 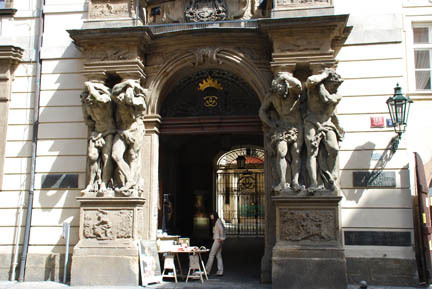 We walked around the Old Town with its narrow cobblestone streets and admired the buildings and their artwork. This theme of "Atlas" type characters to hold up a balcony or porch is very popular. The next day we went to Sedlac Ossuary. 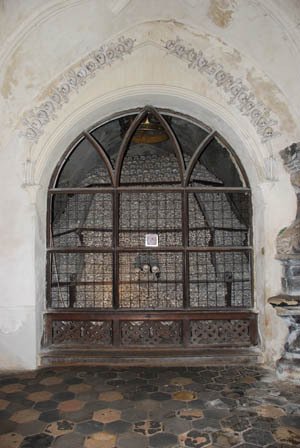 This is a crypt in a graveyard that has been "decorated" with the bones of about 40,000 people. It was done in 1870 with bones from the overloaded graveyard. It has four rooms with a cross-shaped hall between them. 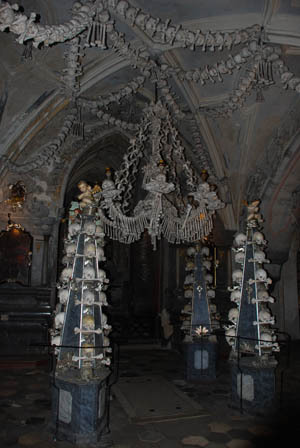 The skull candelabras, bone chandelier and skull garlands (looking like popcorn strings for a Christmas Tree) are at the center. Then each corner room has a big pyramid of skulls and bones behind a screen. Very weird. 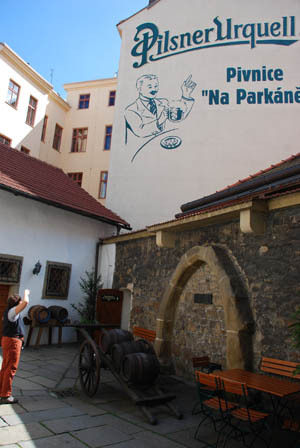 We left Prague and headed to Pilzn, the town where pilsner style beer was invented. The Pilsner Urquell brewery had an excellent museum in an old malting building in the old town. 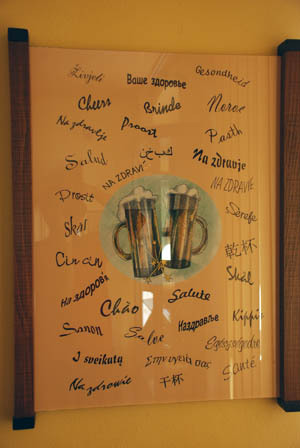 And in how many languages can you say "Cheers!". 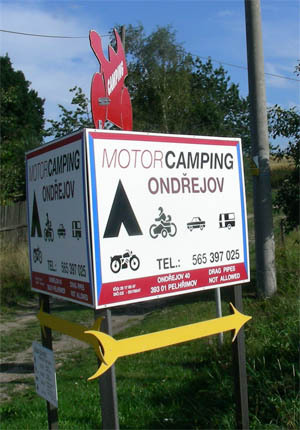 From there it was on to Ondrejov Camping, a motorcycle oriented campground owned by a Dutch couple who are friends of our friends Dirk & Hetty (they loaned us the trailer we are towing). It is a beautiful site with lots of grass and trees. It is run by the owners and is very modern and clean, one of the best we have ever seen on any continent. They have a bar and can provide breakfast and simple meals. (They're not large enough for a full scale restaurant.) It's just right and Scooter and Taxi, their dogs, will greet you when you pull in. We took a day-trip and went to Ceske Budejovice, where they make Budweiser Beer! Budvar, as the town is known, is home to a great beer, much better than the Budweiser made in the USA. They are having a fight with American Bud because it wants to sell its beer under that name in Europe and this brewery will not give up its European trademark to the name. So the US Bud is sold under a similar, but different name. If you remember from our time in Norway we toured the Tromsø Brewery we had to put on full coveralls, including booties and hats, to prevent contamination. And even then they did not let us into the brewing room. Here they not only let us see it all, they served us fresh brew right out of the lagering tanks (these are the aging tanks for beer). This is the unfiltered, un-pasteurized beer and very good. Next was the Budvar Motorcycle Museum. 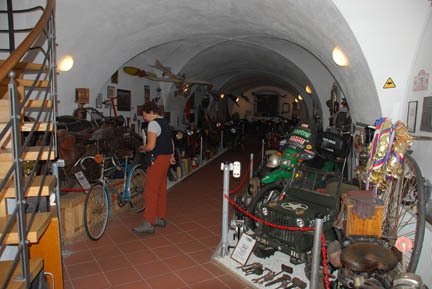 This was a small museum in the old town with two floors of restored and original motorcycles. There were several Jawa motorcycles (a Czech brand) and several WW II motorcycles of various brands among the many here. It was an interesting display but a little crowded. It needed more space to really display all the bikes in there. 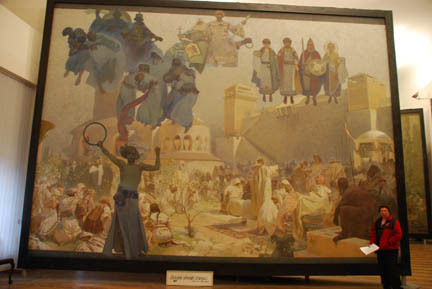 The artist Alphons Mucha (pronounced Moo ka) spent about 30 years during the early 1900's creating 20 huge canvases depicting the trials and triumphs of the Slavic people. He was born in what is today southern Czech Republic and these huge paintings are displayed here. The little ones are about 12 by 16 feet, this one is 20 by 36 feet (8.1 x 6.1 meters). The work is superb even close up. And the history of this area was very war-torn with times of famine and disease interspersed by periods of prosperity and enlightenment. The viewer can definitely recognize the style of Mucha in the people's faces even though this is in no way Art Nouveau. Another day's travel and we were at the Punkva Cave. 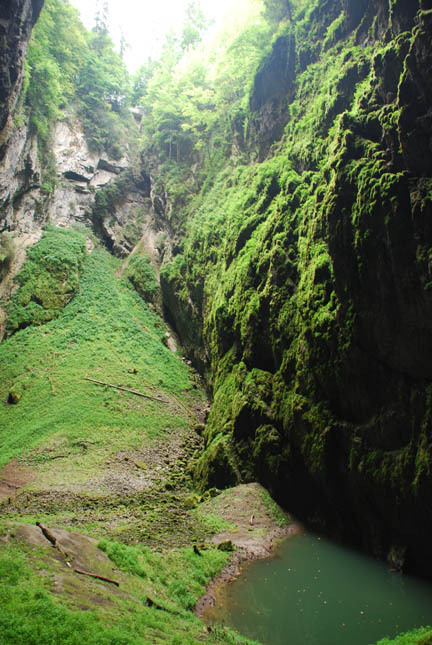 This cave is one of many in an area of limestone gorges in northeastern Czech. We had been warned that one must have reservations in advance to get into the cave, particularly in "High Season". We are here on a Sunday in August and were expecting to have to wait until Monday for an available tour. We walked up to the ticket office at 09:30 and got on the 10:00 tour! We walked two kilometers (a little over a mile) down a steep trail to the cave entrance and joined our assigned tour. We were paired with a Japanese tour group whose leader spoke English, and a local tour guide who also, sort of, spoke English. The guide would tell the tour leader about what we were looking at and the leader when then translate it and tell the group what they were looking at. We just sort of listened in on it all. 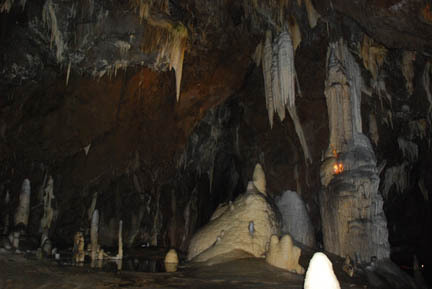 The cave was a series of chambers that had had tunnels blasted out between them. There were connecting passages, but they were not suitable for tourists, hence the blasted tunnels. In the middle of the cave is a sinkhole open to the sky. 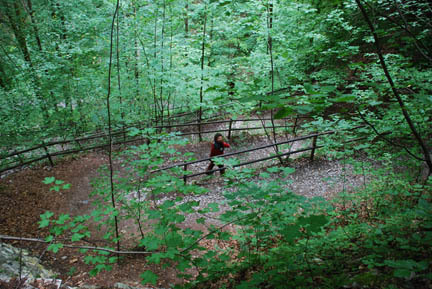 There was a large cement patio-like area with trail leading to and from it. When we came into sight of it we saw that an amateur movie was being filmed on it. A very buxom young lady, barefoot in a long revealing gown was gazing up at the sky while a man played a Didgeridoo (Australian native instrument) in the background. When we were observed by the cameraman and director they moved the camera position to include us in the filming as we came down the trail. Several of the Japanese crowded around the young lady and took more pictures of her and themselves, all the while being filmed by the movie makers. We were obviously unexpected but the director made the best of it. 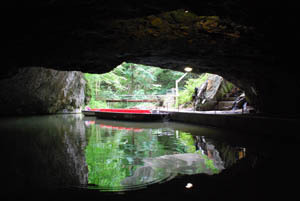 The end of the trail was at a boat launch, still inside the cave. 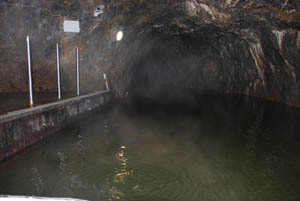 Here we boarded electric boats for a very winding trip along low water-filled tunnels to the exit. From there we walked to the cable-car that took us back up to the rim of the gorge that we had walked down into. We could have taken the cable-car down but it was more fun to walk. Tomorrow we go into the Slovak Republic to visit more ancient towns and mountains.